All things British is what’s hot in London, what with the Olympics, the Queen’s Jubilee and of course, the ever present eat/drink local. 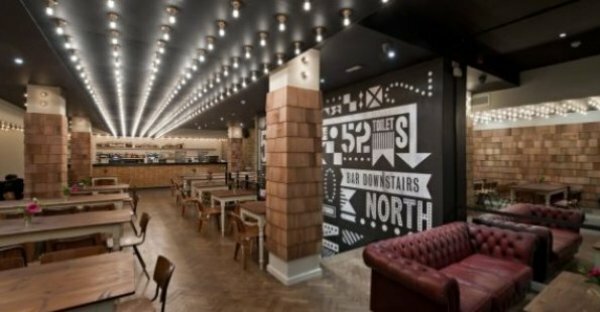 There’s a new spot in Soho specializing in modern British food, 52 North Kitchen & Bar on Poland St. where all the ingredients are sourced from Britain, including many of the wines. A big open space, with communal tables and interestingly, wooden roof shingles instead of wallpaper covering the walls and columns. There is a long bar at running from one side of the room to the other and several old Chesterfield leather chairs and sofas in alcoves scattered around the room. There’s also a cozy basement with another bar to hang out in. What drew me into 52 North was the wine list, more specifically, they are one of the only places in Soho that features English wine by the glass, both still and sparkling. They have 5 still wines and 1 sparkling at the moment but are going to be adding more in the future. I’ve been a bit dubious about English still wines but the Biddenden Gribble Bridge ortega as well as their Bacchus were both refreshing, tasty and easy to drink. 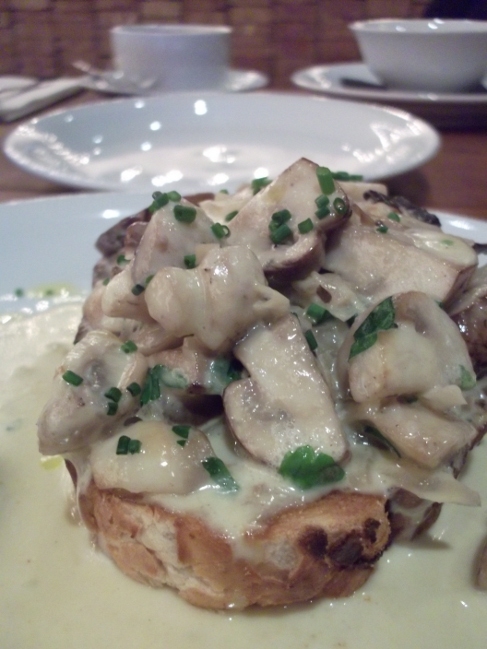 The menu consists of trad dishes like mushrooms on toast, scotch woodcock, Cornish mussels, English pork chop and Arbroath smokies fish cakes among other choices with prices about the same as many a gastropub around Central London. 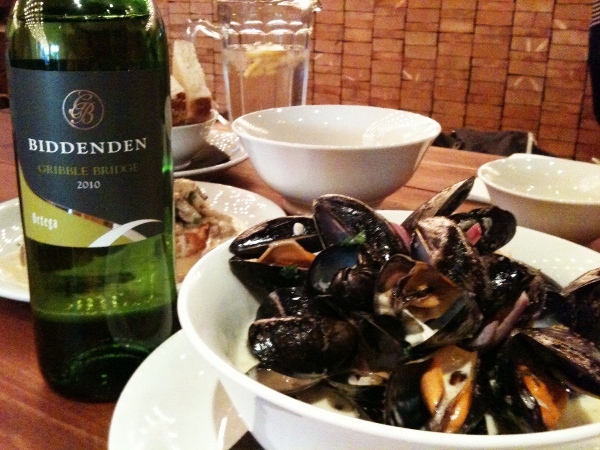 I had the mushroooms and mussels which were delicious with the Biddenden Gribble Bridge 2010. The Gribble Bridge had plenty of bright citrus fruit on the nose, full of fruit but dry nonetheless. I found it very easy to drink. The Bacchus was another light wine, a good substitute for pinot grigio it has a bit more substance to it, more flavour then the average pinot grigio. Priced at £25 quid, I thought it might be a bit pricy, but Tony Ho, part of the operating team, told me that the Bacchus and Gribble Bridge have been flying out the door. Good news for English wine producers if the Soho types are demanding English wine. A relaxed but buzzy atmosphere after work, good English grub and wines, looks like Soho has a new spot to hang out on Poland St. I really want to check this place out now. The presentation looks amazing. You don’t hear to much of the English wines. There are not many restaurants that are offering more than one or two and it’s also nice that 52 North has food that pairs well with the wine. In this way, you can either drink it on it’s own OR have it with a meal. Handy! Thanks for stopping by and I hope you enjoy the bar, if you go after work, the joint is usually hopping! You should also visit The Wine Pantry in Borough Market. They only sell English wine both still and fizzy. They’re not open everyday but they are open when the Market is in full swing, check out their website for more info. I like the look of this place Denise. Great review. Must check it out sometime. Really good to see them listing English wines too.